1 Commercial Real Estate & Properties in Renmark are listed in 1 categories. We have 1 Hotels and LeisureSale . Single operator retiring after 14 rewarding years, is proudly offering this immaculate motel freehold and business for sale. Representing an outstanding opportunity for the astute buyer, this motel is ideally located on the Sturt Highway, directly opposite Renmark's major shopping precinct, within easy walking distance to restaurants, cafes and the Murray River. Renmark recognised as the heart of the Riverland is a popular holiday destination and a convenient stop over point for guests travelling the Sturt Highway being the Sydney to Adelaide link. A constant presence of corporate and trade reservations, recreational calendar events, community and sport events, further ensure a constant flow of visitors to the region all contributing to a constant and reliable source of motel patronage. 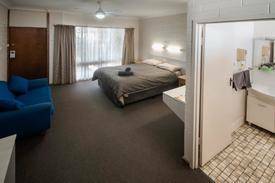 The motel consists of 15 well appointed and maintained rooms offering a popular choice of room styles comprising 2 superior triple rooms, 4 superior twin rooms, 4 superior queen rooms, a family room and 4 standard motel rooms designed and appointed to cater for most guest requests. This very successful motel also comes with a comfortable and spacious 2 bedroom residence, 2 living rooms, kitchen, bathroom, car port private yard and an adjoining reception/office and the added benefit of a guest laundry. A sparkling pool, gazebo and barbecue area truly completes this lifestyle property. Features of this exceptional motel include: Well established business with over 14 years of successful operation by vendor Accommodation income exceeding $280,000 annually with high profit margin Freehold and business asking price represents great return on asking price Huge online presence with profiles on Trip Advisor, Booking.com, Wotif, Hotel.com and many more Functioning website with online booking and enquiries facilities Double brick motel construction with sealed undercover driveway and parking Onsite guest laundry Easy to operate business being Accommodation/Breakfast only The opportunity to acquire an immaculate and profitable lifestyle motel freehold plus business from a genuine vendor at a realistic price, is not often available so interested and motivated buyers should ACT NOW! Bank Finance available to approved purchaser. For more information on this outstanding freehold business please contact VENDOR DIRECT as detailed.